Is Tramadol Rehab Aftercare Necessary? What is Tramadol Rehab Aftercare? Aftercare in addiction management refers to the continuity of care offered beyond the initial phase of treatment. The concept broadly describes continued measures such as counseling, self-help, living-arrangements, behavioral interventions and ongoing medication-assisted treatment offered to support sustained abstinence and drug-free lifestyle. Yes, for many people, aftercare for Tramadol addiction is necessary to maintain recovery. Tramadol is a prescription opioid used in pain management with demonstrated abuse potential - with many such such cases reported in medical literature. Aftercare for opioid addiction has been found to improve recovery treatment outcomes. Use of long-term maintenance therapy--in the form of partial agonist buprenorphine-naloxone (Suboxone)--for prescription opioid addiction has been found to be associated with significant decrease in drug using behavior over a 42-month observation period. Cognitive Behavioral Therapy (CBT)--when offered in combination with buprenorphine-naloxone and physician management--is associated with increased duration of abstinence among prescription opioid abusers as compared to those receiving physician management alone. Contingency management has also been found to be effective in improving treatment retention and abstinence among opioid abusers. While quitting drug use is an important initial step in addiction management, the bigger challenge is to sustain abstinence and lead a drug free life in the long run. Relapse rates are high among those addicted to opioids; some studies have reported relapse rates as high as 90 percent following the initial detoxification period. Greater drug use prior to treatment. History of intravenous use (injecting the drug). Maintenance therapy, when combined with counseling--but offered for shorter periods of time--has not been found to be effective in preventing relapse among prescription opioid abusers. This indicates that relapse prevention needs to be a long-term strategy, aimed at preventing and delaying reuse of opioids. Through successful prevention strategies, someone who has quit tramadol use is helped to identify the high-risk situations that can lead to relapse. Subsequent strategies are then planned to deal with these high-risk situations. The significance of aftercare for opioid addiction management is highlighted by the fact that a failure to enter aftercare has been recognized as a risk factor for relapse. To get more information on the importance of aftercare in relapse prevention you can call 1-888-993-3112Who Answers? to speak with one of our treatment support team members. Don't wait Relapse is a realistic possibility. Find the right treatment now. Drug addiction draws a lot of parallels with chronic medical conditions. In fact, drug addiction is best described as a chronic, relapsing disorder. Both drug addiction and chronic medical disorders have complex underlying etiologies. Genetic, as well as environmental factors play a causal role in these disorders. Personal responsibility--commonly associated with the development of addiction--has an important role in shaping the course and outcome of chronic medical disorders. There has been limited success with regards to the cure of addiction as well as other chronic medical disorders. However, effective treatment options are available for both. Relapse is an accepted part of the recovery process from chronic health conditions. In case of chronic medical disorders like hypertension recurrence of symptoms is observed among 50-70 percent adults. Similarly, treatment adherence remains a challenge for addictive disorders and hypertension alike. Less than 40 percent of individuals with hypertension are completely adherent to treatment. Among those who attempt abstinence from drug use, relapse is a realistic possibility. In fact, relapse has been described as a central characteristic of addictive disorders. Road to recovery from addictive disorders is long and setbacks are expected throughout the journey. However, relapse and return to drug use should not be seen as failure of the treatment. It is best seen as an opportunity to revisit the management plan and make the required modifications. Comprehensive management of tramadol addiction continues beyond the initial phase of treatment and aftercare is likely to play an important role by providing support, counseling, and medical therapy for extended period of time with an aim to prevent relapse and encourage drug-free lifestyle. Cognitive Behavioral Therapy (CBT) when offered in combination with buprenorphine-naloxone and physician management is associated with increased duration of abstinence from drugs among prescription opioid abusers as compared to those receiving physician management alone. CBT when offered as an adjunct to maintenance therapy (in form of methadone, buprenorphine, buprenorphine-naloxone) has been reported to be efficacious in producing beneficial clinical and social outcomes and improved retention in treatment among individuals with opioid addiction. Similarly, the addition of counseling to methadone maintenance treatment improves retention, decreases illicit drug use, and improves program efficacy. Interventions that have been found effective for illicit opioid use have been recommended to be of likely benefit among those with prescription opioid use as well. Narcotics Anonymous--12-step facilitation for opioid addiction--is a self-help program. It is aimed at recovery from addiction by addressing physical, mental, emotional, and spiritual domains. One admits being powerless and self-admits their problem with addiction while working the steps. 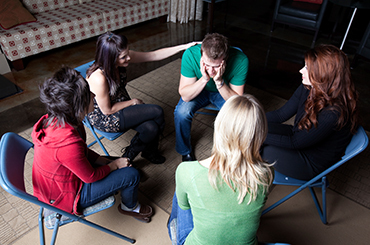 Members are encouraged to share their process of recovery and associated problems with others in the group meetings. One is also encouraged to identify a more experienced member of the group as a sponsor to guide through the recovery process. Attendance in Narcotics Anonymous meetings has been found to be associated with reduced illicit opioid use at 4-5 year follow up. However, the effectiveness of such program for prescription opioid abuse including tramadol abuse remains to be systematically studied. Effective maintenance therapies are available for opioid addiction. These include methadone, buprenorphine, and buprenorphine-naloxone. The effectiveness of these therapies in the long-term management of illicit opioid addiction has been established. Recently a trial reported on the effectiveness of buprenorphine-naloxone for prescription opioid abuse. The Prescription Opioid Addiction Treatment Study (POATS) compared brief and extended buprenorphine treatments and found long-term treatment with buprenorphine to be more effective for prescription opioid abuse. Similarly, there is evidence to support the use of naltrexone (available as oral and depot formulation), especially in conjunction with behavioral intervention in preventing relapse to opioid use. Prescription opioid abuse is associated with different adverse physical and mental health effects including drowsiness, nausea, constipation, euphoria, confusion, slowed breathing, depression and anxiety. It is important to seek appropriate medical care for these adverse health effects. Additionally, it is important to assess and manage the individual for the underlying pain condition or the psychiatric disorder that could have contributed to initiation and continuation of tramadol use. A therapeutic community is an example of a long-term residential program. Therapeutic communities are planned around a central core of group activities directed toward effecting significant changes in the residents' lifestyles, attitudes, and values. These are designed to allow positive changes and stabilization in the client's attitudes and lifestyle with an emphasis on pro-social behavior. It is best suited for those recovering addicts who require a structured support system even after the initial phase of treatment. A recent review on the effectiveness of therapeutic communities reported improved substance use, legal, employment and psychological outcome among residents. However, retention in these programs remains a challenge as the drop-out rates tend to be high. Therapeutic communities have proven effective for prison inmates as well as special groups such as those with co-morbid psychiatric disorders. Contingency management (CM) is a behavioral therapy aimed at preventing or reducing drug use by making positive reinforcement such as vouchers or privileges contingent on drug-free behavior. Contingency management, when offered as an adjunct to maintenance therapy for opioid addiction, has been found to reinforce drug abstinence and treatment attendance. Similarly, it has been associated with improved treatment retention when offered in conjunction with naltrexone treatment. Social support is necessary for maintaining recovery after treatment. Seeing a relative or a friend fight the battle of tramadol addiction can be challenging. The adverse consequences associated with tramadol abuse extend beyond the user and affect the significant others as well. Family and friends need to be aware of their own psychological and emotional health and discuss their feelings with others. There are self-help support groups for the family members of friends of drug users that you can access. Additionally, family and friends can play an important role in recovery from addiction. Research has shown that higher functional social support at treatment intake is a positive predictor of retention in treatment. You should get well informed on the issues related to tramadol abuse and its management. You can be of immense help in getting over the barriers to aftercare and encourage your loved one to remain engaged in treatment. Relapse has been described as a central characteristic of addictive disorders. The road to recovery from addictive disorders is long and setbacks are expected throughout the journey. However, relapse and return to drug use should not be seen as failure of the treatment. It is best seen as an opportunity to revisit the management plan and make the required modifications. If you or someone you love has seen their prescription tramadol use turn into a daily struggle, marked by an inability to cope without the drug, it's time to seek help. Our treatment support team can provide more information on aftercare options at 1-888-993-3112Who Answers?. 1. Weiss RD, Potter JS, Griffin ML, et al. Long-term outcomes from the National Drug Abuse Treatment Clinical Trials Network Prescription Opioid Addiction Treatment Study. Drug Alcohol Depend. 2015; 150: 112-9. 2. Cutter CJ, Moore BA, Barry D, et al. Cognitive behavioral therapy improves treatment outcome for prescription opioid users in primary care-based buprenorphine/naloxone treatment. Drug Alcohol Depend. 2015; 146: e255. 3. Petry NM, Carroll KM. Contingency Management Is Efficacious in Opioid-Dependent Outpatients Not Maintained on Agonist Pharmacotherapy. Psychol Addict Behav. 2013; 27(4): 1036-43. 4. Smyth BP, Barry J, Keenan E, et al. Lapse and relapse following inpatient treatment of opiate dependence. Ir Med J. 2010; 103(6): 176-9. 5. Ferri M, Finlayson AJ, Wang L, et al. Predictive Factors for Relapse in Patients on Buprenorphine Maintenance. Am J Addict. 2014; 23(1): 62-7. 6. Mclellan TA. Drug Dependence, a Chronic Medical Illness. JAMA. 2000; 284: 1689-95. 7. Drummond DC, Perryman K. Psychosocial interventions in pharmacotherapy of opioid dependence: a literature review. WHO Geneva. 2007. 8. Gossop M, Stewart D, Marsden J. Attendance at Narcotics Anonymous and Alcoholics Anonymous meetings, frequency of attendance and substance use outcomes after residential treatment for drug dependence: a 5-year follow-up study. Addiction 2008; 103(1): 119-25. 9. van den Brink W, Haasen C. Evidence-Based Treatment of Opioid-Dependent Patients. Can J Psychiatry 2006; 51: 635-46. 10. Vanderplasschen W, Colpaertp K, Autrique M, et al. Therapeutic Communities for Addictions: A Review of Their Effectiveness from a Recovery-Oriented Perspective. The Scientific World Journal 2013; Article ID 427817. 11. Carroll KM, Ball SA, Nich C. et al. Targeting behavioral therapies to enhance naltrexone treatment of opioid dependence: efficacy of contingency management and significant other involvement. Arch Gen Psychiatry 2001; 58(8): 755-61. 12. Dobkin PL, De CM, Paraherakis A, et al. The role of functional social support in treatment retention and outcomes among outpatient adult substance abusers. Addiction. 2002;97(3):347-56.